All eight of the main-span towers are now complete for the cable-stayed crossing being built to replace the Tappan Zee Bridge in New York, USA. 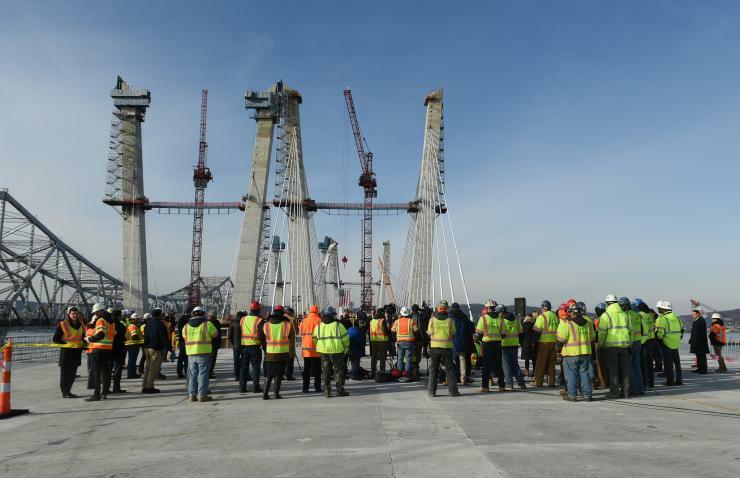 Cuomo viewed progress at the New NY Bridge project site, including the tower’s construction, stay cable installation, structural steel placement and road deck installation. The 127.7m towers stand at a 5° angle. They are 30.5m higher than the top of the current Tappan Zee Bridge and feature a chamfered design. Other recent milestones include the driving of the final pile into the Hudson River; more than 1,000 piles have been installed. Cable installation is well under way, with more than a third of the 192 stay cables now fully anchored and tensioned on the main span. The I Lift NY ‘super crane’ has been at work setting steel. The super crane is capable of lifting the equivalent of 12 Statues of Liberty at once and will also help with the demolition of the existing Tappan Zee Bridge. Tappan Zee Constructors - a joint venture of Fluor Enterprises, American Bridge, Granite Construction Northeast and Traylor Brosis - is responsible for both the design and construction of the 5km bridge.